Whether it's for a Valentine's Day gift or pick me up for any time of the year a scene of beautiful blooms puts a smile on everyone's face. When entertaining at home, it's always nice to have fresh cut stems around your living quarters. Most often a single stem will do in a sweet little vase will do the trick but if you want to flex your florist muscle give this DIY a shot. If you are planning a trick to the local farmer's market make sure to pick a color palette appropriate for the season and ask what flowers are best for the time of year. The shape of your vessel is key in determining the look of your arrangement. For example if you choose a long, low to the table long vessel your arrangement might appear more wild, natural and spilling over. A vessel with a long neck will create a more upward growing arrangement. For starters, we suggest a simple low, wide and round shape to begin. Loosely insert your selected wild greens such as umbrella ferns, olive branches and bay leaves in a circular pattern to fit the neck of your vase. An interlock of the stems in your base will be created after completed the first direction and moving the greens in the opposite direction as a second layer. A florist pro tip is to avoid flower foam which is also eco-unfriendly. Try to use the stems to create a structure that holds the arrangement up itself. These techniques give the arrangement a more natural feel. Take a quick look at your vessel to fill in any negative space with additional textured greens. If you want to keep your arrangement loose and natural, keep in mind to create an organic, asymmetrical shape. Also, using the greenery of different lengths will add to that romantic wild, overgrowth look (if that's what you're going for). Congrats, you have created a base! Now on to the fun stuff: the textured flowers that will act as a "middle-ground." Proceed cutting your selected blooms (i.e veronicas, frittilaria, etc) at different lengths and be playful by experimenting with their placement in varying positions in your vessel. Break out the blooms! Roses, ranunculus, poppies, peonies—these are the first thing people will notice when falling in love with your centerpiece. Begin with placing your blooms low and and close to your chosen vessel, then you can proceed to spiral out with longer stems. You might want to keep asymmetry in mind when creating my pieces. The longest stems can create an enchanting silhouette. To get a feel for your work, take a step back from your arrangement. Continue playing with the composition until intuitive your centerpiece feels right. Take this time to edit your arrangement. Polish and balance your centerpiece by adding greens, or changing the position of flowers. You might want to make sure the flowers aren't too tightly squeezed into an arrangement, but again it's your choice when it comes to these decisions. Give your flowers a once over, push necessary stems back and bring some forward, decisively tweaking the angles that they are positioned. Just like that you have a gorgeous centerpiece you made all on your own. Pat yourself on the back because it feels good to create your own beautiful work. 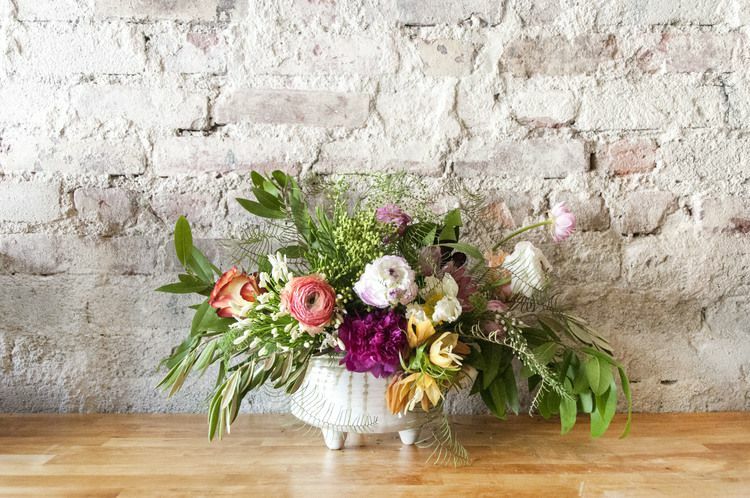 Find the best spot in your apartment to present your arrangement.